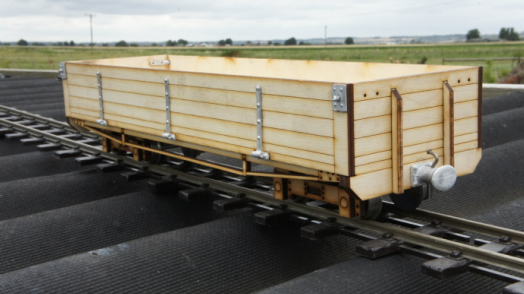 Although not a model of any particular prototype this wagon is typical of the coal and mineral wagons used all over the world and would not look out of place in any setting. The model consists of a sturdy chassis, with turned steel wheels running on 1/8“ axles, on which is mounted a wooden body made from plywood with ready-machined planking. There is a wealth of detail in the form of white metal castings. The chassis can be constructed using the nuts and bolts supplied or could be soldered or epoxyed together. The kit comes complete with all you need except for paint and glue. Designed to compliment the goods wagon kit and the existing range of rolling stock this kit is of manly wooden construction, all major components being laser cut cut to size with window apertures and planking detail engraved in where appropriate. 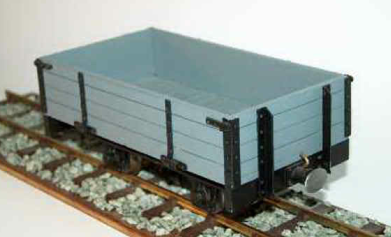 Whitemetal buffers and steel wheels and axles are all included. Instructions are easy to follow and the kit is suitable for modellers with limited experience as only simple hand tools, glue and paint are required to complete. more experienced modellers can, no doubt, find their own ways to personalise their model, but the standard kit, painted or varnished, makes a fine sight at the rear of a goods train. They are available in 32 mm or insulated 45 mm gauges.